So my goal of posting an entry a day has been postponed due to the fact that I have been so sick for the last week, in fact this is the sickest I can ever remember being!! I have completely lost my voice, and am coughing my brains out, have not slept a full night of sleep in over than a week!! All my goals, inspiration, worries have been put on the back burner while nursing myself back to health. So my parents were here this last weekend and we had such a nice time. I am always complaining about living in San Diego but this was a spectacular weekend for weather and it is fun playing tourist here. 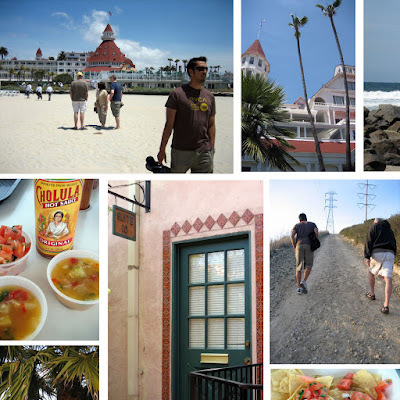 We went to Coronado which truly transports you into another time and place and we did lots of walking and hiking and of course eating Baja Fresh. So I have not blogged for a while..so busy...but I am back and I have a goal of an entry a day! Life as usual has been crazy, I am not quite sure how exactly I am making my schedule work right now but I have been able to fall into a groove with the balance in my life. I cannot believe that I work a day job (which I love) and that have a second job- I work and LIVE with college students and am actually making it as an artist. I recently signed a book contract- YIKES and have officially started the process of writing and creating for the book- so exciting yet daunting but I have this feeling that this crazy juggling that I am doing may be coming to end in the not so distant future. In the meantime it seems that because I am so busy I am actually more focused and productive as an artist. Back in college if I had a painting or a project due, I would procrastinate until the 11th hour and waste all sorts of time doing other things! Now I don't have that luxury and it is actually working in my favor- I am more creative, more productive and quicker to plan and execute art. And to top it off, all the college students I am around actually keep me current, yes I am only 32 but there is still a huge difference between myself and 20 year olds. They keep my eye, and taste current and actually challenge my creative thinking. And the best part of this journey right now is sharing it with my husband. He is the greatest support and even though he usually has can't keep my schedule straight but he has this amazing ability to make me feel like it is all going to work out.